Wally Kunimoto’s 22-inch Shimpaku in our Tokonoma at the 2015 show. Ann Erb returns on Tuesday evening to discuss show preparation. There is a lot to think about: Is the tree ready to show? Is the pot suitable and clean? Do you have a complementary stand? And how about a nice companion plant? 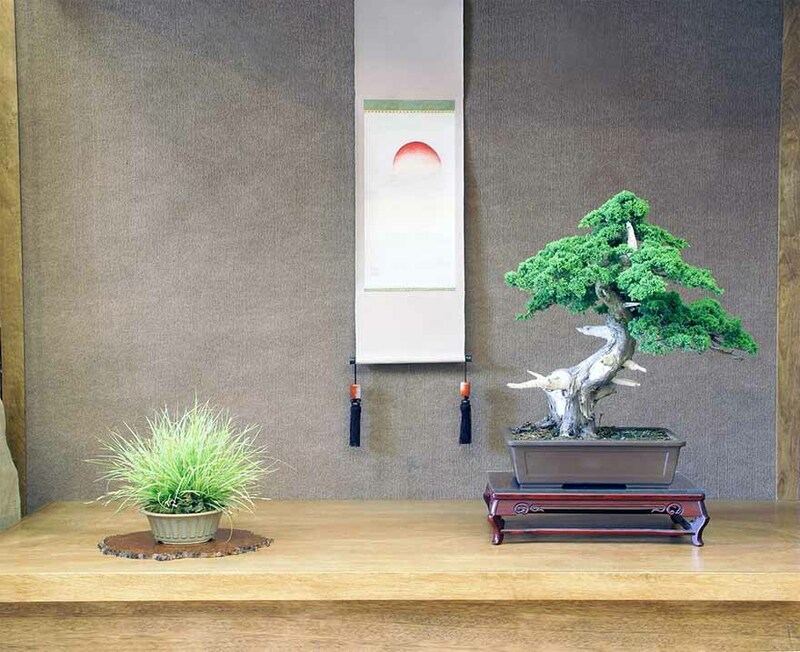 And then how are the tree and its complementary plant best set up on the show table? Is it a right-facing tree or a left-facing tree? 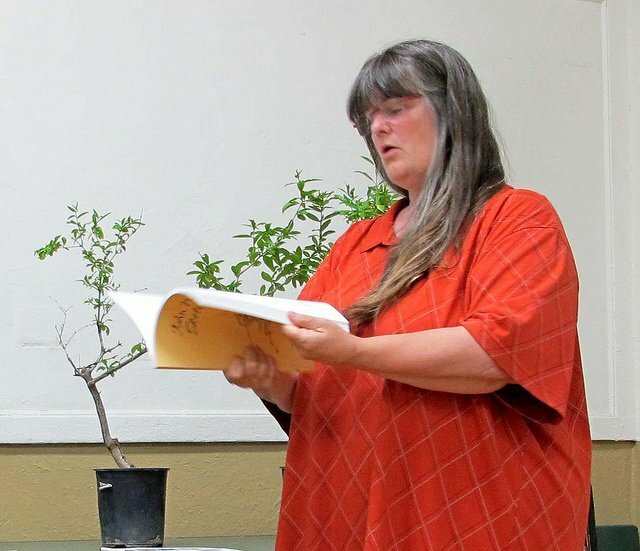 Ann has been showing trees for years and is our on-going show coordinator. She has an extensive collection of pots and stands. 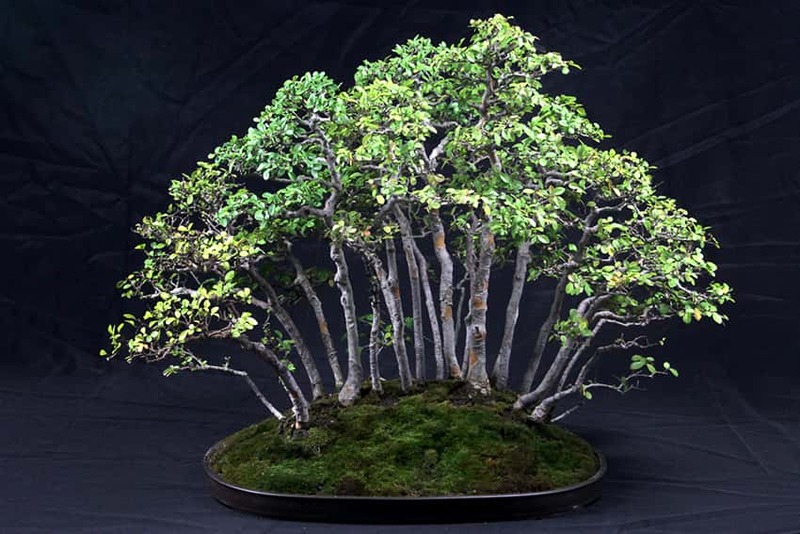 If you have a tree that you are contemplating entering in this year’s show but you don’t have a stand, please bring your tree to the meeting so that Ann can match it with one of her stands which you can then borrow. But wait! There’s more! It’s not too early to start thinking about 2018! Ann will also talk about what we should be doing now to get ready for next year’s show. Please consider bringing in a tree that you think you might want to show next year and you’ll go home with some good ideas on how to make the best of the next 12 months. Arrive by 7:00 for socializing. It’s time for the club’s biggest event of the year, our annual show and plant sale! I think our club’s show is always outstanding with very nice trees and excellent presentation. 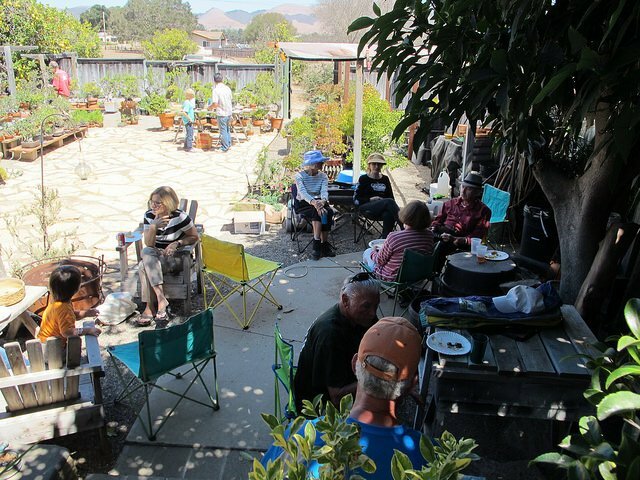 Please fill out the tree entry form and return it to Ann Erb by the date of this month’s meeting, and have your plant sale forms filled out and your sale items numbered and priced when you bring them to the Botanic Garden by 10:00 AM on show day. Plan to meet at the Botanic Garden at 8:00 AM on Saturday, May 20, to set up the show and then be there again to tear it all down on Sunday afternoon at 4:00 PM. One of the remarkable things about our club is that we always have a lot of volunteers on hand both on Saturday morning and Sunday afternoon. It’s a big job but if there are lots of hands on deck it can almost be fun. Ann Erb and Mel Ikeda will do the demos again this year. 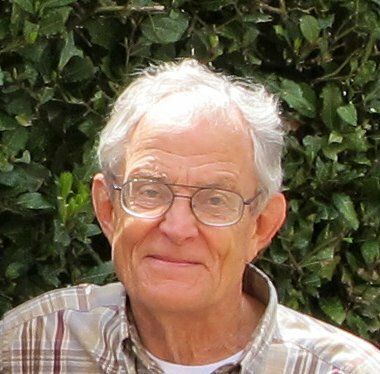 John Bleck will be soliciting items this month for the silent auction. Leroy Kubel will once again use his photographic skills to take pictures of the show trees at 4:00 as soon as the show closes on Saturday. If you’d like to help him, stick around and see how he performs his magic. See you at the show! I was unable to attend Leroy’s presentation this year, as I was stuck in the South of Spain, overlooking the Mediterranean Sea, drinking cervesas and eating tapas (sigh). 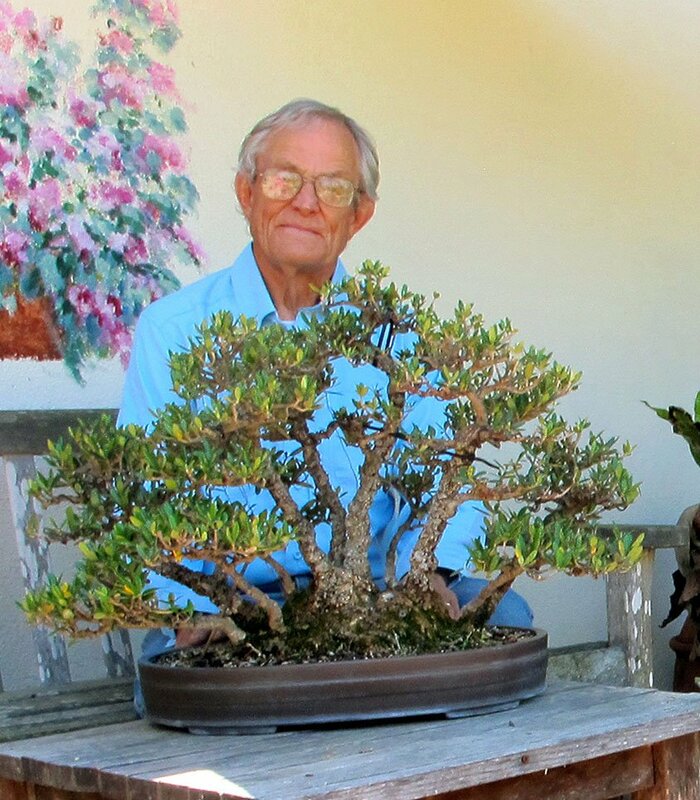 But Wally tells me it was a great presentation of our annual bonsai shows for 2015 and 2016. 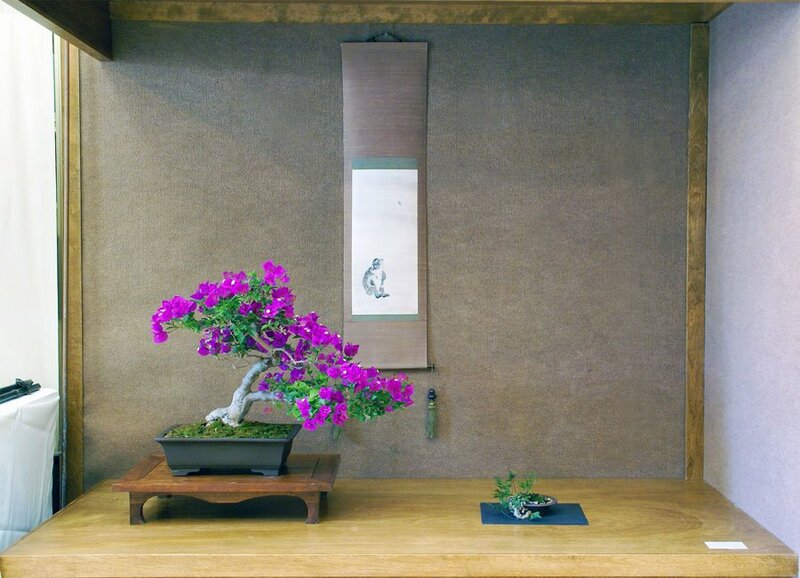 Tokonoma with Tom’s Bougainvillea, Semi-Cascade, 24 inches. 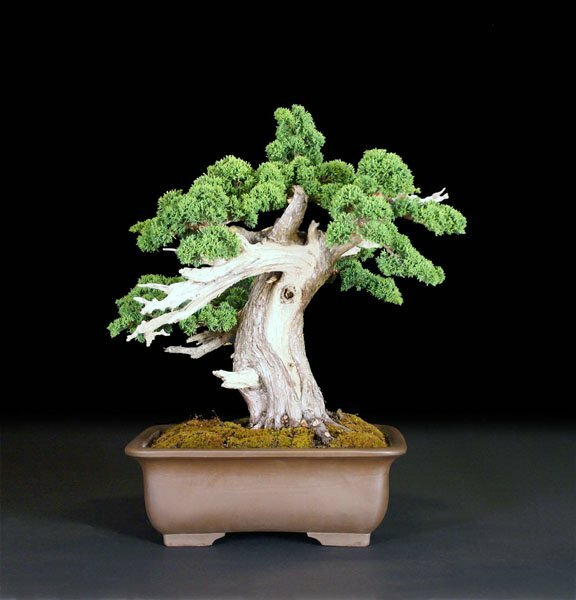 Mel Ikeda Demonstration, Prostrata Juniper, Windswept Style. 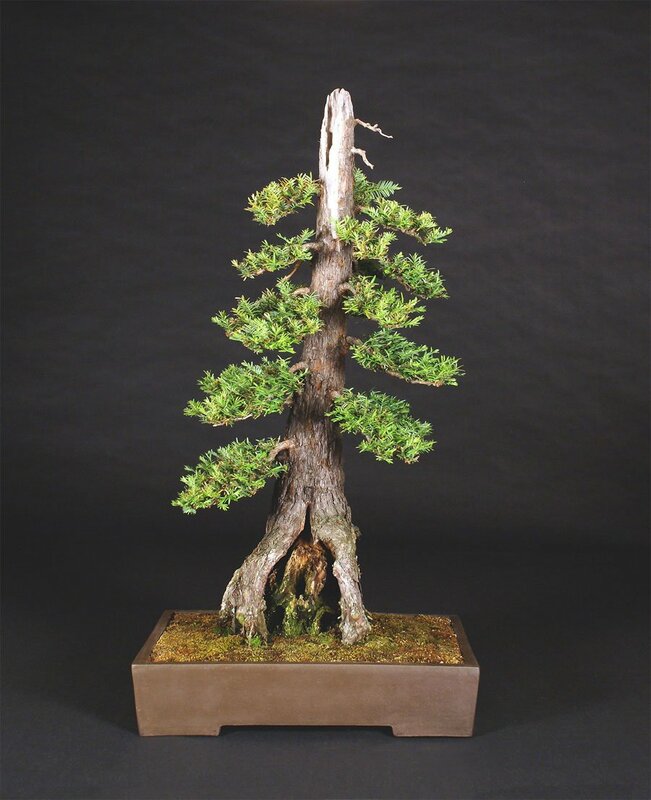 Steve Iwaki’s, Coastal Redwood, Formal Upright, 42 inches. 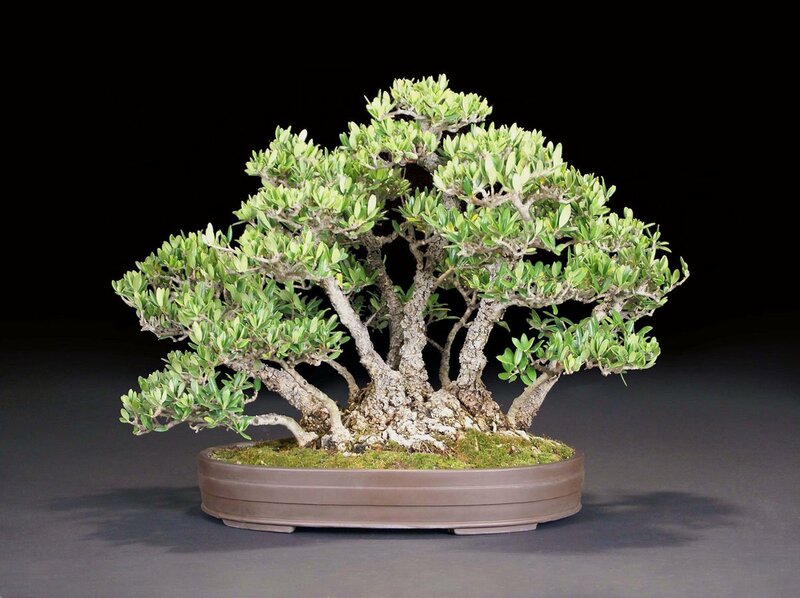 Besides bringing trees, pots, tools, and other bonsai-related items for sale, John Bleck wants to remind everyone that donations for the silent auction are greatly appreciated. The silent auction has become one of the more popular events at the show and all proceeds directly benefit our club, enabling us to continue to provide workshops and demonstrations of the highest caliber. The Club has decided to make the membership list, including mailing addresses, email addresses, and phone numbers available to all paid members. A link to the pdf file was included with the newsletter email. If you find an error in your information please email changes to Tina Hammond bhammond23@cox.net. If your information does not appear on the list, it may be that you have not renewed your membership. Tina will be happy to take care of that for you, also. 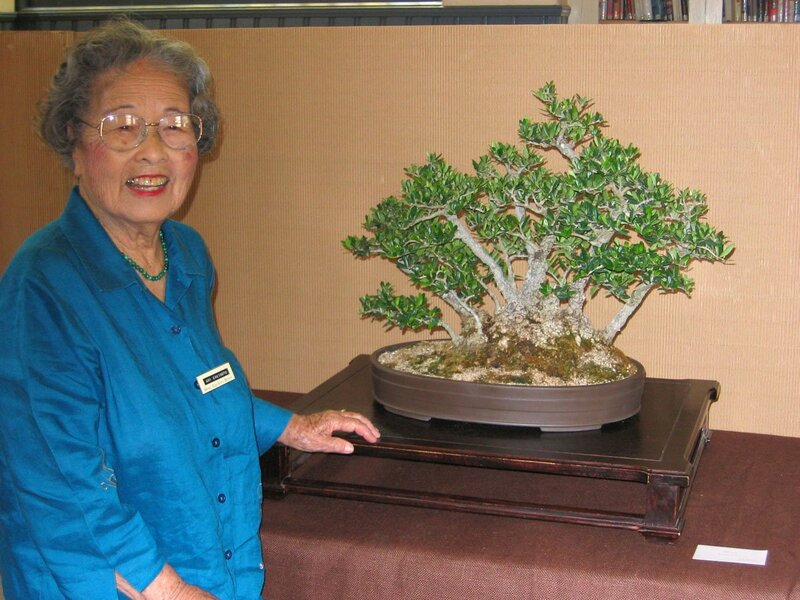 Amy Kakimoto, a charter member of our club, used to like to tell the story of how this old clump style olive belonged to her and her husband Ikey when, in 1942, all people of Japanese ancestry on the west coast were ordered on short notice to be evacuated out of their homes to distant “relocation centers”. They quickly gave the tree to a Caucasian family who lived in Pasadena to take care of. After the war when Amy and Ikey had returned to their home and gasoline and tires once again were readily available, they drove to Pasadena to retrieve their tree. Amy died in 2011 at the age of 101. I acquired the tree from Amy in May 2000. I did some restyling and repotted the tree and showed it for the first time at our show in 2004. The first picture shows the tree and Amy at the show that year. Amy, a youthful 94 at the time, was still driving. The second picture is Leroy Kubel’s photo of the tree at the 2011 show. The third picture shows the tree and its current caretaker as of April 2017. 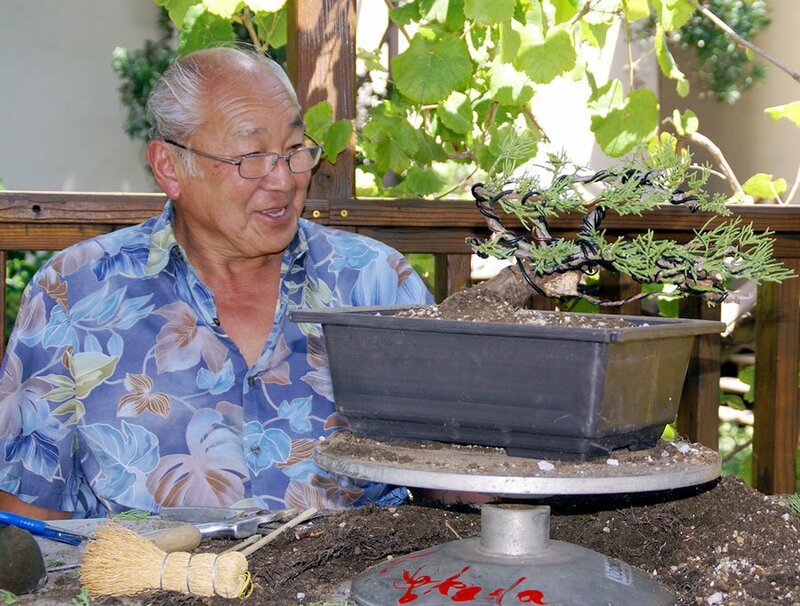 Ted Matson, the curator of the bonsai collection at The Huntington in San Marino, says the tree is probably one of the oldest bonsai in continuous cultivation in the country and he would like to add it to their collection because of its historical value. I have promised to donate it, but not just yet. It reminds me of my friend Amy and it still has ties to our club and to the Santa Barbara area and should stay here for the foreseeable future.